You CAN indulge in a creamy sauce completely guilt-free of the extra calories! I am not the best at sauces (yet!) so I admit that I buy jars quite often. However, I was making tilapia and decided I would come up with my own sauce to jazz it up a bit. I felt like something creamy but of course without the calories. Good thing I had some yogurt on hand! 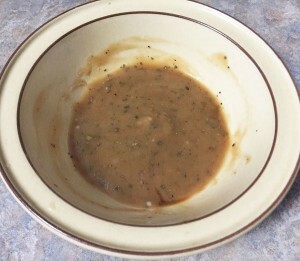 For this sauce I combined quite a few different ingredients on a whim and it turned out DELICIOUS. I added yogurt to thicken it up and give it that rich texture. I’m sure you can use greek yogurt, but for this recipe I personally used So Delicious Coconut Milk Yogurt (which also makes this dairy-free). I used some of Marzetti’s honey balsamic sauce in my mixture also, but you can substitute just honey and balsamic and come close to the same! I will say that this was my first time to use Marzetti’s and I will definitely be exploring this brand more! I plan to cook some veggies soon with just this to really explore the flavor on it’s own. 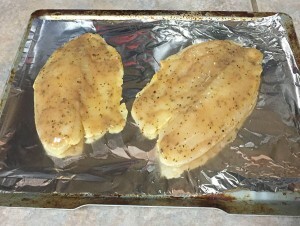 Once the creamy lemon balsamic sauce was put together I spread some over the tilapia filets and put them in the oven. Bake those at 400 for about 12 minutes. Easy and quick! While they cooked I sautéed some veggies. 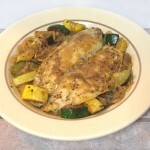 I chose both zucchini and squash for my dish. When the tilapia was a minute or two from being done I poured the sauce over the veggies in the pan on low heat. For my pasta I used kelp noodles, which don’t need to be cooked. I put them in to the skillet anyway just to mix them up with everything for about 20 seconds to make sure they were fully coated with the warmed up sauce. I wasn’t all that hungry when I made this but I gobbled it up ridiculously fast. Hands down this is one of the best sauces I have ever made! It went wonderfully with the fish, pasta and veggies- so I’m sure it will be very versatile for future cooking experiments. 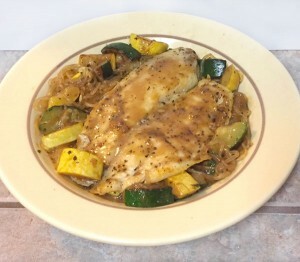 Kelp noodles with tilapia, zucchini and squash in a creamy lemon basil honey-balsamic sauce. Start with the sauce. Combine the yogurt, lemon, balsamic and honey (or marzetti's sauce), some oil and herbs and seasonings together. Stir until well blended. Coat the tilapia filets with the sauce. Place on a foiled baking sheet and put in the oven at 400 for 12 minutes. While tilapia cooks sauté the chopped veggies in a pan with some olive or coconut oil. I had them on medium heat for about 10 minutes (covered part of the time to steam). When the zucchini and squash is ready pour the sauce over and stir continuously for about a minute or two. I also threw in my noodles towards the end of this time. When everything is ready just top the pasta and veggies off with the cooked tilapia and eat up! You can substitute your noodles of choice for this recipe. For those of you that have never used kelp noodles, I highly recommend trying them! They require no cooking so you can toss them in to salads, power bowls, use them as pasta, in wraps, etc. Although they are somewhat high in sodium, they are loaded with iodine. If you like your noodles al dente then kelp might be the thing for you! My favorite brand is Gold Mine. This looks delicious! I’m not a big tilapia fan but this makes me want to give it another try! It definitely makes the fish a lot more moist and flavorful!